A rotted timber beam end was uncovered after a casing was removed. The beam was repaired in-situ. About our Structural Timber Repairs using the Rotafix system, including carbon fibre reinforcement with links to photos, project descriptions and technical information. We use the Rotafix Resiwood Systems to achieve Low Disturbance Structural Restoration of Timbers. 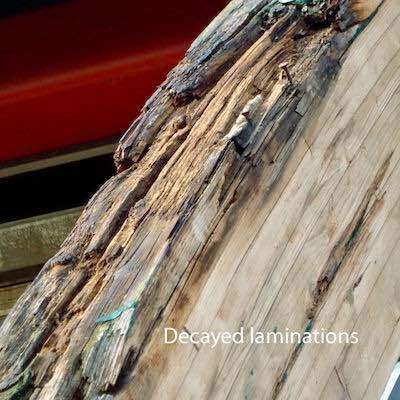 The method involves cutting out decayed timber and replacing this with reinforced resin. The systems may also be used to increase the strength of existing overloaded structural timbers. The header photo shows a “failed” timber beam supported on temporary steelwork. The timber beam was repaired in-situ and restored to full load bearing capability. Working in conjunction with Rotafix, we are expanding the use of Carbon Fibre Plate Reinforcement as an alternative to the more conventional steel reinforcement. Rotafix Ltd have included a case study of the work we carried out to reinforce a floor beam at Chetham’s Library in Manchester, originally constructed in 1421. Please contact us to discuss your particular structural timber failure issues. We will be pleased to visit and offer remedial solutions. These decayed laminations on a Glulam Arch were repaired in-situ. Our Rotafix System, Glulam Repair and Carbon Fibre Reinforced Timber photo albums show examples of repairs to large structural timbers that we have carried out using the Rotafix Resiwood Systems. Link to the Rotafix Web Site for a description of the repair system. 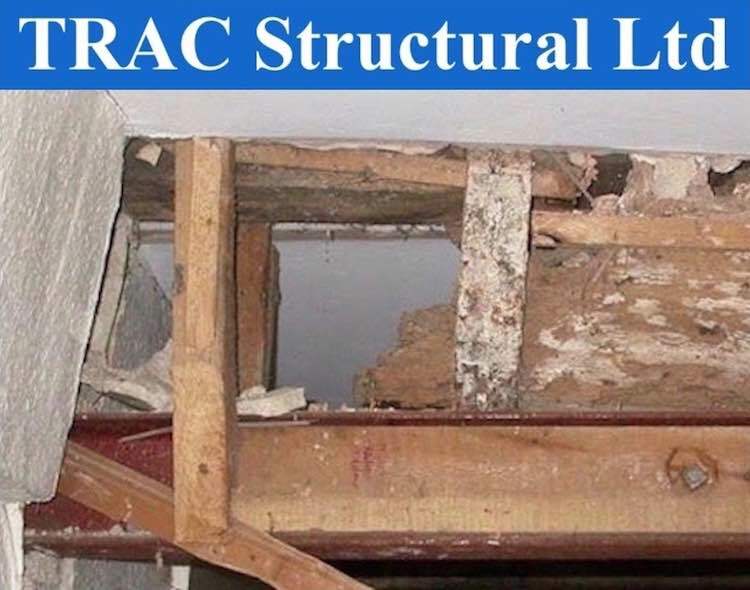 TRAC Structural Ltd is a Rotafix Recommended Contractor and we provide a comprehensive service from initial visit through to installation of a repair scheme.